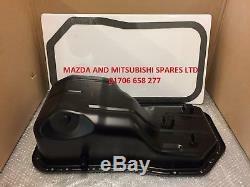 MITSUBISHI L200 K74 OIL SUMP PAN + SUMP GASKET. This SUMP will not fit any L200'S newer than 2006 or older than 1996. YOU WILL GET : x1 OIL SUMP PAN AND SUMP GASKET. Mazda & Mitsubishi Spares Ltd Corporation Road Rochdale OL11 4HJ. The item "Engine Oil Sump / Pan For Mitsubishi L200 K74 2.5TD 4D56 (01/1996-12/2007)" is in sale since Thursday, April 26, 2018. This item is in the category "Vehicle Parts & Accessories\Car Parts\Engines & Engine Parts\Oil Sumps". The seller is "mazda-and-mitsubishi-spares-ltd" and is located in Rochdale, Lancashire. This item can be shipped worldwide.